Topic: Why I hate USC. In 1964, I was a sophomore football player at Clemson. I was raised up north & knew nothing about the CU-USC rivalry. That year we played USC in Columbia. All of the other players told me to keep my helmet on & face down as we entered & exited the field. At that time the stands came down to field level, and I can remember as we entered & exited the field, I had #### fans spitting on me, throwing drinks on me & calling me every vile name in the book. I see that after 50 years, they are still the same. .
That was right before OJ went there, right? Re: Why I hate USC. I hate them too. They don't show the song girls enough. Be thankful they couldn't afford to throw batteries in 1964.
Who wants to have to defend yourself against every drunken slob coming by when you're trying to get out of that horrible place. Not me, never again! Nope, not insulted by the "USC" reference, but my preference is SCar. Thank you for representing Clemson. I can barely remember but think that may have been the year we lost by a point.Amazing, getting spit n as far back as the 60s. I have had numerous chicken fans claim they have been treated horribly at Clemson but I have been to at least 40 Clemson Chicken games and have never ever seen Clemson fans act like I have seen chicken fans act dozens of times, really every time at billy brice. If you are Clemson fans and do that classless stuff, STOP IT! We are better than that. My Dad played freshman ball at Scar and hurt his shoulder in spring ball and they dumped him. Howard, an assistant at the time, tried to get him to come to Clemson but he foolishly refused. And foolishly pulled for the poultry for the rest of his life, even though they dumped him. 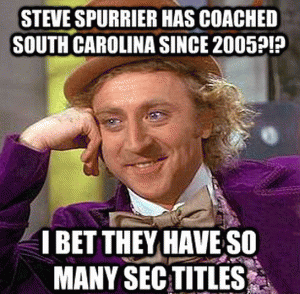 When I hear people say I pull for Carolina but pull for Clemson when they are not playing Carolina I want to just say "Shut up liar!" because I have been to billy brice. But Dad was actually that way, he actually facilitated my northern cousins to come to Clemson when they had no realistic way to get through Rutgers or other colleges up north. But something changed. There is no obvious reason it changed from a decent rivalry to the classless jerks they are today. Let's be the ones to raise the standard. It they want to be the ones to continue the low life crap, let them do that. I haven't been back to that dump since the mid 60s and I sure don't miss it. Had to fight my way to car only to find it damaged. At least I won my 2 battles. They are exceptionally petty fans. I know this is a little off topic but I said the same thing you did after attending the Louisville and NC State games this year - if there are Clemson folks behaving like they do at those places (which I will never go back to) then don't. Stop it. We are better than that. I think you're looking for the UCLA board Dude!